A dining room is one part living room, one part kitchen allowing you to provide a formal or informal space to display gourmet meals and entertain guests. Except for those special occasions, a dining room may not be a popular hang out in your home, so it can build up clutter quickly if not properly maintained. This space should always be clutter free, look sophisticated, but feel comfortable. While a dining room in the Naperville area may rank low on a buyer’s wish list, the room can certainly show buyers a lifestyle they could lead if purchasing the property. Another easy upgrade in this room is updating or replacing your current light fixture in the room. Consider adding a luxurious touch by switching out your ceiling fixture with a chandelier. This is the easiest way to catch a buyer’s eye. A chandelier comes in several styles so choose one that coordinates with the design styles and finishes in the room. A dining room can appear smaller than usual if it’s cramped with too much or oversized furniture pieces. Often times a homeowner will purchase a dining set to save money without anticipating how much square footage the room has. Dining tables are notorious for their ability to double or triple in size, so make sure the table fits the scale of the room. Remove a leaf or two, along with the extra dining chairs if you need more room. 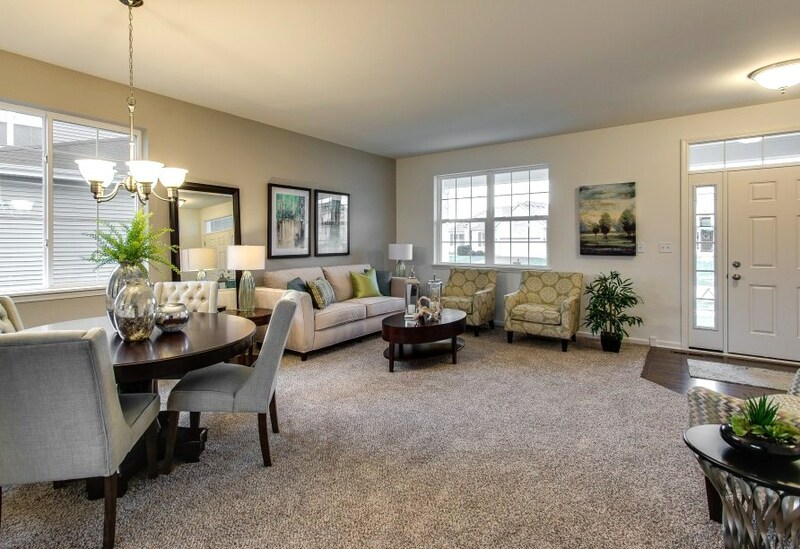 At Chicagoland Home Staging, we want to offer ample walking space for the buyers to walk around the table, so a good rule of thumb is to have 36 inches between the table and the wall or next to any furniture piece. Speaking of other dining room furniture pieces, we recommend no more than two-three pieces in a formal dining room. When this room is not being used for entertaining, the space can become a makeshift office, toy room or place to drop off items easily allowing for clutter to build over time. When selling you want to take away all items that are not associated with fine dining. Remove tablecloths from the table, many times they can make the space look dingy or dated. Also, take a look at your tabletop surfaces and the hutch– less is more when displaying items in these areas. Greenery and florals – The main accessory in a dining table is a centerpiece. Choose a centerpiece that is seasonal mixing a combination of greenery, flowers, even candles or another seasonal décor to make sure the piece is to scale with the table. The centerpiece should be the right size to fill the center of the table without being too big or too small. Soft goods – Plan on replacing the tablecloth with a table runner or placements. Play with different textures in these items to create interest. You can also, play with color or go neutral. You can also leave your table bare. Wall art – Often times we’ll use a large mirror in a dining room to not only reflect light around the room but to highlight the gorgeous chandelier hanging above. We also use large pieces of abstract art overtop of credenzas to fill empty space and create an interesting focal point as shown in the photo above. Rug – When choosing a rug for this room it’s important to consider the measurement of your dining room table. The rug should be big enough to allow for the dining chair to stay placed firmly on the rug when pulled out for seating. This accessory can also be used as art to provide texture, pattern or color in the room. Lighting – We’ve already talked about chandeliers, but another lighting option to have in this room can be wall sconces to set the scene. They come in a variety of styles so choose one that fits the hardware and style of the room. If you have a large, empty tabletop surface try placing two identical table lamps on either side of the piece of furniture to lighten up the space. Dishware – If you have a hutch in the room, highlight a few of the empty shelves with simple, elegant dishware, preferable white. You can also add crystal pieces, stemware or a tea set to make the space look lived in. It’s not necessary to set a dining room table when staging, however, you can leave a stack of dishware on the table to suggest the idea of entertaining. Decorative Accents – Since there is so much tabletop surface in a dining room, plan on using a few large pieces like vases, bowls or sculptures to help create a statement or further a theme. Use a piece on its own, or group smaller items in odd numbers to provide one cohesive look. Let us know whether you have a formal or informal dining room and often you use the space in the comment section below. 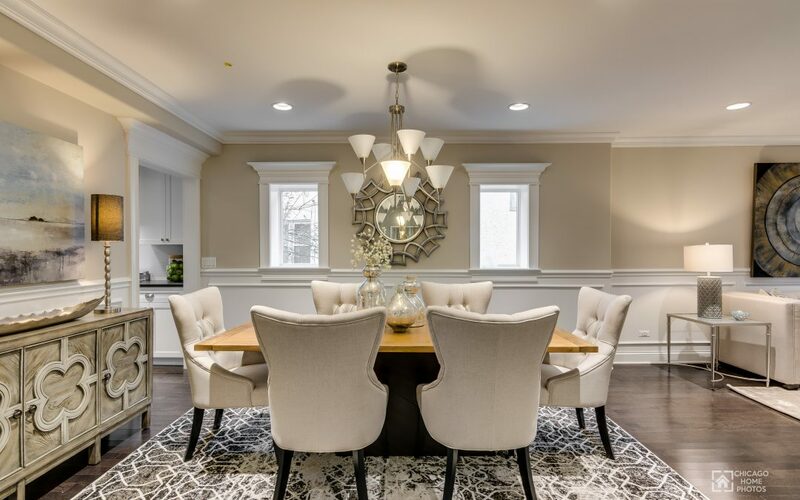 Need help staging your Naperville dining room? Contact us today! We’d be more than happy to assist you with your home staging needs.